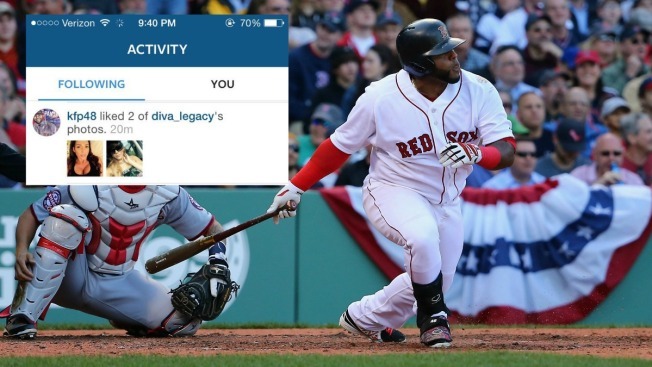 While the Red Sox were in Atlanta Wednesday, playing their way to their eighth loss in nine games, their third baseman was liking a local woman's Instagram photos. Comcast SportsNet New England reports that Pablo Sandoval apologized, saying he hopped on Instagram while he was in the bathroom during the seventh inning. He got caught liking two photos by @diva_legacy. The Braves beat the Red Sox 5-2. Manager John Farrell benched him for Thursday's game for violating the team's social media policy. The third baseman apologized to his manager and teammates. "I made a mistake," Sandoval told reporters Thursday. "I let my teammates down. It ain't going to happen again. I'll take the punishment."